Natick, MA such a lovely town, filled with awesome people. Also filled with many homes in need of exterior renewal. We are siding contractors that provide great service and have completed many projects in the area. These homeowners decided that it was time for a change. 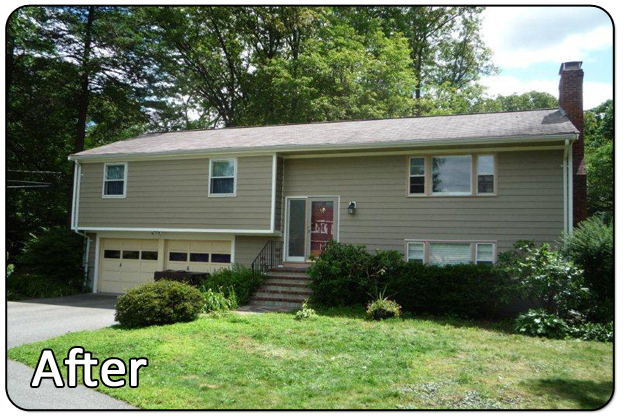 They were tired of living in their old-style home with outdated, cracked vinyl siding. 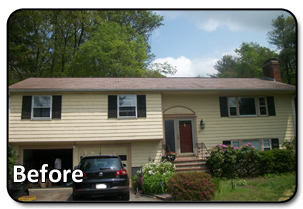 They were soon introduced to Everlast Composite Siding and the product spoke for itself. They shortly decided that Everlast was the right siding for their home. Their home required a complete demolition of the siding, while the window trim needed a prep and paint. The homeowners fell in love with the Misty Taupe Everlast and couldn't wait for the transformation to be completed and rightfully so as their home looks took on a new contemporary look to it.